Peru has 30 million inhabitants, 28% of which are youth ages 10-24. One-third of these youth live in poverty. This situation is even more pronounced in peri-urban and rural areas, where youth leave school with few prospects of continuing higher education or technical studies. For young women in particular, the situation is even more precarious, as early pregnancy limits education and employment opportunities. Schools have few resources and little training to support youth in their personal and economic development and are characterized by: low quality education; high levels of violence and discrimination (racial, cultural, gender-based), insufficient education of students and training of teachers in sexual and reproductive health (SRH), employability, and core life skills; and high rates of adolescent pregnancy (13%). Several studies show that girls are neither developing their full potential nor getting the opportunities to study technical and scientific careers. Stereotypical messages reinforced by teachers, schools and even parents, limit the possibilities for girls to enter non-traditional, technical careers. The gap between insufficient technical training and employers’ demand for skilled labor means positions go unfilled and many youth, especially females, are missing out on better paying jobs in growth sectors. The new National Curriculum approved in 2016 and effective 2017 (with a phased rollout) requires Basic Education (initial, primary, and secondary school) to emphasize a technical/entrepreneurial education and incorporate a gender approach. Schools do not have the skills, training or pedagogical tools to do so. There is a greater need than ever for organizations that have expertise in technical training with a gender focus, such as AAV, to support schools through this implementation. Founded in 1985 and currently led by one of its original founders, AAV works with a team of sociologists, gender specialists, and educators. AAV works locally and nationally to improve the status and leadership of working women in Peru to ensure that women have equal access to quality jobs and training opportunities (including those traditionally reserved for men), and to ensure that women’s rights are respected in the workplace. AAV provides direct trainings to women and women’s organizations on leadership development, technical skills (including in male-dominated careers or trades), entrepreneurship, and labor and other human rights. AAV’s research, trainings, campaigns, and advocacy engage local and regional governments in promoting women’s participation in Peru’s economic development, focusing on their leadership capacities, their rights as workers (both remunerated and non-remunerated), and addressing discrimination in the workplace. 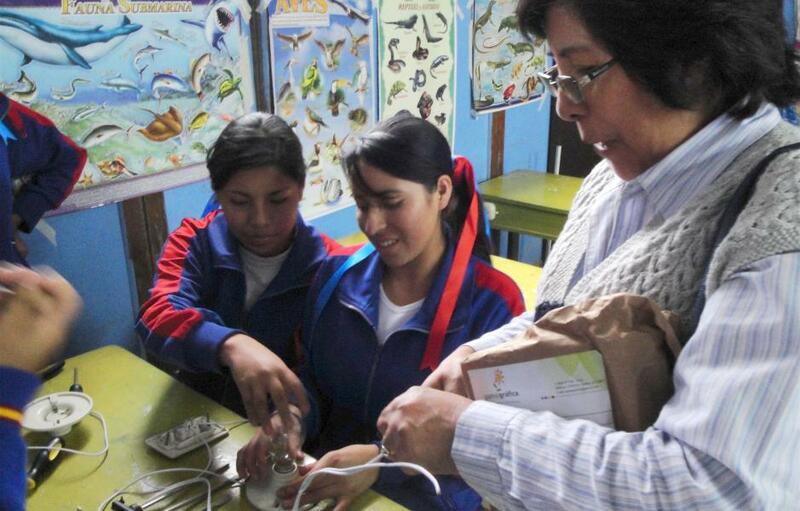 Their efforts have led to the adoption of more gender-equitable economic development programs in several Peruvian provinces, as well as increased attention from regional and international organizations focused on rights-based economic development. AAV’s trainings have also led to the establishment of several women-led businesses in non-traditional areas (electricity, appliance repair, refrigeration), as well as strong alliances with other NGOs, technical schools, employers, and local and national authorities. EMpower’s 6th and final grant to AAV seeks to consolidate the institutional experience AAV has developed in 3 schools of Lima (technical courses: electricity, electronics, design & technical drawing with a gender focus aimed at female students) for official incorporation into the secondary school curriculum, as well as translate it into a political and pedagogical proposal to influence the Ministry of Education to validate and adopt it as a tested, proven model satisfying the gender approach mandate in the new National Curriculum. Where is Asociación Aurora Vivar?